The first participants at the EGEE 4th User Forum / OGF25 are starting to arrive in Catania, ready to get a head start on the meeting. 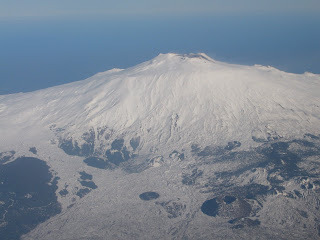 We were greeted by amazing views of a snowcapped Mount Etna as we flew in over the island (fortunately it seems pretty docile at the moment). The venue, La Ciminiere, looks great and you certainly can't miss us - there's a 15 foot sign hoisted onto the front of the building announcing us in very large letters. The EGEE team will be there tomorrow to get our booth ready - B15 if you'd like to come and visit us. Fill out our web survey and you win a small prize... Registration opens from 16.00 tomorrow so get there early to beat the queues on Monday! It's stunning! So excellent to have blue sky! Judging by the weather and the first day, this will be great event.